What many guys don’t realize is that a woman wants to feel lucky to be with her man, not like she’s doing him a favor by being his girl because he can’t attract other quality women like her. So, when she sees that the guy she broke up with is now in a new relationship with another quality woman, she begins to see him with different eyes. All of a sudden he seems more valuable to her and she begins to want him back. In the same way, once your ex saw you with another woman, she may have come to realize that she made a mistake in letting you go. She now sees that you’re the kind of man that other (attractive) women feel drawn to, so you can’t be as bad as she made you out to be (i.e. you’re more confident, emotionally masculine, charming than she perceived you to be at the end of your relationship together). As a result, her defenses come down and she begins to want to be your girl again. The great thing is that you are in control of the situation, not her. What she wants is irrelevant. So, if you want her back, you can easily get her back by reactivating her feelings for you during 1 or 2 interactions and then getting her back into a relationship with you. Alternatively, if you decide that you prefer your new woman, you can close yourself off from your ex and continue building your new relationship. When a woman breaks up with a guy it’s usually because certain aspects of his thinking and behavior are turning her off (e.g. he’s too emotionally needy and clingy, he seems to be drifting through his life without a purpose or direction, he treats her like a neutral friend so she doesn’t feel feminine or girly when she’s with him). When that happens, a guy might get quite a shock and begin to question why he got dumped by the woman he loves. He may then see that he made some mistakes in the relationship with her, so he quickly takes action to change and improve and become a better man than he was before. Of course when that happens, he automatically becomes more emotionally attractive and he easily finds himself a new woman. In the meantime, if he interacts with his ex (e.g. he talks to her over the phone, catches up with her in person) and she sees that he’s changed in the ways that are important to her, she can’t stop herself from feeling respect and attraction for him again. That may be confusing for a guy and he may wonder what kind of game his ex is playing, but what he might not realize is that it’s all because of him. He’s a better man now and that is attractive to his ex. So, if your ex has had the chance to interact with you and has seen for herself that you truly have changed and improved in some of the ways that actually matter to her, it’s only natural that she will want to get back with you. You are now the kind of man she always wanted you to be, so being broken up with you feels wrong to her and therefore she wants you back. There are some women in the world who are selfish, self-absorbed and want everything to go their way. So, when a woman like that breaks up with a guy, she will usually be looking to find herself a replacement man as quickly as possible to make herself feel better. However, when that doesn’t happen right away and she also notices that her ‘useless’ ex is actually the one who has already replaced her, it might annoy her. As a result, she may decide to try and seduce her ex back into a relationship with her, so she can feel good about herself (i.e. that she’s attractive enough to steal him from another woman). At the same time, she will secretly continue to look for a replacement guy. Then, when she does find a new man, she can dump her ex again knowing that she is the powerful one, because she was able to manipulate him to her advantage. So, if you suspect that these might be your ex’s motives, then it’s very important that you don’t get fooled by her, because she’s not worth it. 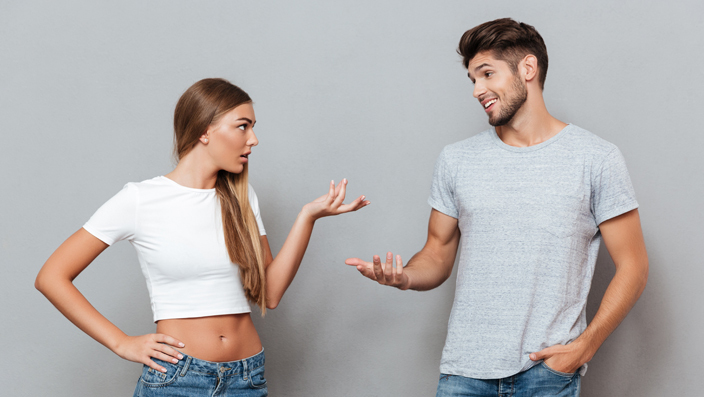 You deserve much better than a nasty, manipulative woman and if you’ve already found a better girlfriend, you need to stick with her and grow the relationship with her, rather than get tricked into dumping her by your selfish ex. Sometimes, all it takes for a woman to realize that her ex was truly the one for her, is for her to suddenly be faced with the idea of losing him to another woman. For example: Imagine that a woman breaks up with a guy because there are certain things about him that turn her off (e.g. he has a tendency to quickly give in to the will of others, he’s not assertive enough, he’s a bit jealous and controlling). However, she may still have some feelings for him and somewhere at the back of her mind she might be thinking things like, “Maybe we just need some time apart to let things settle down between us and then see if we can sort things out and get back together again,” even though she doesn’t openly admit that (even to herself). She may then reach out to her ex and try to get him back before it’s too late. Although a woman definitely does want to be loved and appreciated by her man, in most cases, she doesn’t want to be his main reason for living or his primary source of happiness. Unfortunately, a lot of guys don’t know that, so they often make the mistake of giving up everything else in their life (e.g. hobbies, interests, personal goals and dreams, friends), just to spend all their time with their woman. In his mind, a guy like that thinks he’s being a loving and devoted boyfriend and that his woman will be amazed by his dedication and in return, be loyal to him too. Yet, what he doesn’t realize is that when a man makes his woman his reason for living, he will eventually become emotionally dependent on her for his well being. As a result, if she’s not being overly loving or giving him all of her attention all of the time, he begins to feel insecure and like he’s losing her. He then becomes extra clingy and needy, which actually causes his woman to feel smothered by him. She then naturally begins to lose respect for him as a man and she starts to close herself off from him. This makes him feel even more insecure and so he becomes even more clingy, until she gets fed up and breaks up with him. A woman wants to be with a man who is happy, confident and forward moving in his life with or without her. If he can’t cope on his own without her, she will quickly lose respect and attraction for him as a man and begin looking for a real man to take his place. However, if after they break up he finds his own identity and becomes an emotionally strong and independent man, she will naturally start to feel attracted to him again. She may then try to get him back, even though he has already moved on, because he is now the man she always wanted him to be. If you’ve moved on without your ex and are happy, then that’s great and it shouldn’t even bother you that she wants you back now. It’s probably true to say that in life there are no guarantees. This is why, if you decide to give your relationship with your ex another chance, it’s possible that it might fail again. However, it’s also possible that you and her might end up staying together for life, because that’s when you feel the best, most fulfilled, most loved and happiest. If in your heart you truly believe that your ex is the woman for you, do you really want to let her go, simply because you don’t have a guarantee that you and her won’t break up again? In other words, if you feel your ex is your ideal woman and you don’t try to get back with her, you may end up regretting it for the rest of your life. Be emotionally courageous enough to take the lead in the ex back process and get her back. That’s how a real man does it. He might then ignore her texts, or refuse to meet up with her again and again. Basically, he’s hoping that being unavailable, she will wonder, “What is he up to? What isn’t he telling me?” and then want him even more. However, it rarely (if ever) turns out that way. Instead, she either feels turned off by his unnecessary arrogance, or she fears being rejected and hurt if she continues to pursue him, so she gives up and moves on. So, if you decide that you want your ex back, then go ahead and make it happen, rather than waste time playing mind games with her and end up pushing her away for good. A guy like that doesn’t realize that, as long as he can make his woman feel a renewed sense of respect and attraction for him based on the changes he’s made to himself during the break up, he can easily guide the both of them into long-lasting feelings of love and passion. The truth is, falling back in love with each other after a break up is one of the most amazing feelings a couple can experience in life. There’s just something special about being able to fix things up and be happier, more mature, more in love and more connected to each other than ever before. It’s a really awesome thing to experience and literally millions of couples do it every year. People break up and get back together all the time. You can be one of the men who successfully guides his woman back into a relationship. You are new man now and your ex is a new woman. As a result, it’s only natural that you and her will experience a whole new relationship with each other based on the people you have become. So, don’t be afraid to make it happen. She wants you, so go get her! What Can I Text My Ex to Make Her Miss Me?